Agriculture provides a livelihood for farmers. Most families are completely dependent on the success of one or two crops per year. Nowadays it is common practice to purchase costly hybrid seeds. The seeds produced by these plants cannot be used as seeds for the following year. Additionally, the use of vast amounts of chemical fertilisers and pesticides is the mainstream approach to obtaining good yields. Over the years, however, this has drained the soil of its natural fertility provided by minerals and micro-organisms. Consequently, the need for artificial supplements has increased, further adding to the financial burdens of farmers. 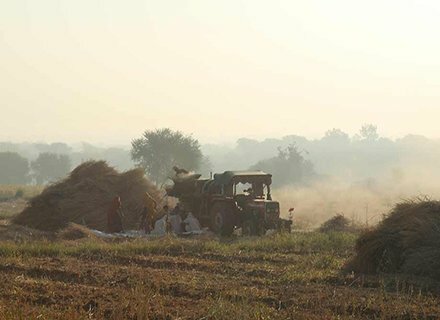 For individual marginal farmers, it is very difficult to break from these established practices. Any changes to the methods applied on their own land (mostly around one or two acres) can put their entire crop at risk. After various discussions with such farmers, whose primary concern is making sufficient income to feed their family, it became apparent that in order to enhance their income, group farming is the best method. As a group, it is much easier to receive all-round support from governmental and nongovernmental organisations. Amrita SeRVe has been promoting and supporting farmers to form groups consisting of 10 to 30 farmers. To date, eleven such agricultural societies have been established in different states. Farmers’ capacities are thereby increased through collective savings, use of government subsidies, well-planned cultivation methods, conversion to organic agriculture for restoring land fertility, which in turn, has been increasing revenue and improving overall health. All these steps can lead to a sustainable livelihood, economic independence and social empowerment. Increase the livelihood of poor and marginal farmers. Improve the overall health and security of farmers in food, social welfare and safety. Involve government and local authorities in supporting sustainable agriculture. Adopt innovative methods to make effective use of available resources and restore the land.